A once amusing podcast with Luke Smith aka(The scarab lord) has now degenerated into a group of emo teens discussing how kara went and such. Not worth listing to after june the 20th or so when luke left. Crummy podcast. One guy sounded like he was chewing on something, they don't actually play much wow, and they just ramble on about stupid crap while not being funny. There are much better wow podcasts out there, including Outlandish if you want banter involving people who actually know the game and are funny. OMG, I used a swear word. Don't tell my mom! Seriously this 'show' is a couple high school kids hanging out. "LOL, OMG why can't I grow a mustache yet. LOL, OMG, oooh f- bombs. WoW? I barely play it anymore. lol lol lol lolcats." If you're a lolcat, this is the show for you. All 1UP Podcasts cancelled upon Ugo's acquisition of the 1UP Network. Sure, Demian was gone, and they brought all these new guys in, but they actually seemed to have a plan now. And now it's gone. Been listening since day 1, and I can only say that I will miss this podcast. Good luck to all the people from 1UP. Anyway, an actual review? This podcast has been funny, informative, and a good way to pass the time for the past... year and a half, or so. Where'd the original cast go? I loved this podcast back in it's early shows, but now it seems to be becoming less entertaining as a show due to the fact that some of the original cast has left or is not there most of the time. To be honest, I really do not like the new co-hosts, and this has taken away from the show, in my perspective. The jokes are now lame, and it feels like an entirely new, immature show. I quit listening after the show on 12/11. Ummmm... my bad, I didnt know this was a warhammer podcast. These guys have gone waaaaaaayy downhill. Used to be a pretty informative show, but they wont shut up about warhammer. I have a mac, and thus dont care about warhammer and dont feel like subscribing to a podcast about it. Plus, their voices are annoying. This show talks less about wow and more about other things, but it still ends up being one of the best podcasts out there. The guests are consistantly good, and the topics are always fun. I wonder if this is really a Wow Podcast. The last podcast talked about Warhammer for like the first 15 minutes. A few episodes ago you guys talked about Age of Conan for like 30 minutes. So is this really a WoW podcast? The shows are sporadic at best. They are never on topic. There is basicly 0 end game and they are always behind with their information. I would expect more from 1up honestly. Get people who really play and care about the game. EDIT- this podcast is STILL fail. Some of them haven't even played in a year!! How can you talk about something you haven't been using? Love the show and the group but if you give one more beta spoiler I am out. Great podcast. Upbeat, informative, fun to listen to. But there is a major volume problem with it. I have to turn my computer's volume up to 80% to listen to it at the same level I usually listen to podcasts at a nice 30%. I also can barely hear the podcast on my commute through my iphone. I'd love to listen more, but I'm going to have to drop it if the volume isn't pushed up a bit. Hope you guys can work out the issue. Although it isn't always that informative, it is very funny and great fun to hear. A great group of people who make it seem like a group of friends casually discussing the game.... only they are getting paid... Unfortunately, they don't come out very often... and i miss Luke. GJ 1Up! Informative, funny, and well done. I would give this podcast a five out of five if they played more Warcraft and posted more shows. It's so much fun listening to them discuss their experiences - my girlfriend has even downloaded and listened to every single episode back to the beginning of the show. Post more often guys! And tell Karen to get better and get back in the show too! The best WoW podcast out there. Lots of humor and the chemistry is awesome. Drink some water! Or sit back from your mic!!! I Really want to listen to this. and I try all the time. But I can't get past the smacking and breathing into the mic. I'm sure the content is entertaining...and I know this is a personal iritation. but. Its every other word theres a smack or a swallow or a gross! I had to express my frustration at my inability to listen to this informative pod cast. I put this game away for a few months,until i found this podcast.The information drew me back into a game that i very much thought i was done with,and the crew holds much space on my itouch. This podcast is awesome, the crew knows a ton about the game and are just plan fun to listen to when your playing WoW Get this podcast now! 1 more thing, get the ScarabLord no the show guys! i saw that the review number for this podcast was 69 and we cant have that but i love this podcast and im wondering wer are the new ones guys i mean none since febuary cmonWERE ARE THEY? Informative and funny podcast, just wish it came out more often :( Not to mention they have outstanding family values. They just talk to hear themselves. This entire cast seems boastful and full of self-appreciating "humor". The hosts find themselves entirely too humorous and witty, and focus far too much on their own experiences in the game. Go listen to the instance or wowcast if you want a good quality show. pass on this high budget waste of time. I love the podcast and the interesting banter. Keep up the good work. Well, I want to just say WoW! This podcast is so interesting, with all of you giving your views and inputs on the situations. I am constantly checking to see if there is a new episode every week. You guys are great keep it up! This podcast has the most hosts and almost none of them actually play wow anymore. They all seem uninterested and would rather talk about tabula rasa or orange box then talk about wow. So skip this podcast and go listen to "The Instance" the best wow podcast out there. I just wanted to say that I have been listening to your podcast since January and I really enjoy its casual and laid back style. However, I really think that the addition of Ryan Scott into the show has really brought it down. You really got to stop inviting this guy to be on your podcast. All he does is mock everything about Warcraft without having a very good frame of reference, which quickly becomes obvious as he asks numerous noobish questions and makes a plethora of incorrect and hypocritical statements. He talks about being into all of these other MMOs, but it sounds like he is a total noob in those also. Maybe instead of having six MMO subscriptions, the idea that he is better than everyone else, and male-emo PMS (probably due to being ridiculed as an adolescent), he should actually learn about the games he "plays." If your podcast were the episode of "Saved by the Bell" where they restart the old Bayside radio station, then Ryan Scott would be the A.C. Slater of your podcast :-(. Other than that your show rocks. Keep it up. At work trying to find a podcast I like is comparable to trying to grind rep in wow. There are a lot of horrible wow podcasts out there and even the best ones usually center around people I find myself disagreeing with. The legendary staff however are incredibly funny and even though they can be off topic they are the most helpful in my opinion. Definately the best wow podcast out there. Liven it up a bit! I enjoy 1up's casts, usually. They have great discussions and information. But this podcast has to be one of the most difficult to listen too. 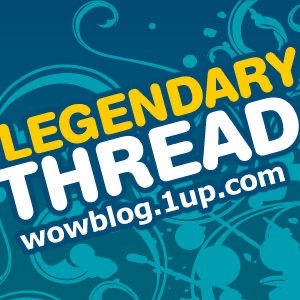 I listen to several wow podcasts and enjoy most, the problem with 1up's wowcast is that they all sound completely bored and uninterested with doing it or talking about the game. If doing this cast and the 1up show and podcast is too much for you guys, then please dont do it. The last show was actually cut off at the break and I was quite peaved by that since I listen to my podcasts at work to pass the time. Very disapointing. I know that you guys are busy doing many things, but at least sound like you enjoy your job, or at least fake it for me. Those of you looking for a podcast for wow can find many of them other than this one. But hopfully they will step it up and make it worth while. Makes my daily drive enjoyable! I truly would be miserable without having this excellent podcast to listen to every week. Great job guys! Yall have a great mix of chemistry at the table that gives all my WOW sides a voice. Keep it up! This show rocks, it is pure entertainment to hear these folks blather on about wow, get thrown off topic, and blather more about WoW, love the show keep it up, and Bring back the scarab lord! Since Luke Smith left 1up, there is no longer any reason to listen to this podcast. Time to throw in the towel, people. Much chatter and no useful information make this PodCast a waste of time. The banter is not even fun and at times painful. They get a lot wrong, often sound confused, and always seem to be searching for content to discuss. The fact that most of them don’t seem to have high level characters might have something to do with it. I have listened to 4 episodes only to find that there is very little to learn from these guys. There are too many good WoW PodCasts out there so go elsewhere. Sorry. Bring Back the Scarab Lord! I love these guys. I especially love the episode about RP hunters. Too bad you guys can't get Luke online for the podcast. If you love WoW, you need to listen to this!! Love these guys. By far my favorite podcast (even if they do get off topic). Its fun to listen to people who don't think they know evrything and are just true gamers. love the relationship between all the characters jeff green, damien, karen all of em. and karen chu is hot! As a former Everquest player I've never played WoW but after hearing the GFW guys talk about being on your podcast I had to take a listen. I may have retired from Everquest but maybe a future is in store for me in WoW. You guys really make it sound like a fun time and Your Can't Quit You guild sounds great. Meh...this show primarily consists of a bunch of gaming professionals rambling on about stuff...and not much of it is WoW. While it can be enjoyable, the host is completely humorless and sounds as if he might be hungover at each recording. In addition, the most talented/clever part of the show just left a few weeks ago. Very little helpful info. Just listen if you want a re-hash of Wow Insider combined with some decent banter. If you're looking for The Instance/World of Warcast, This ain't it. But it's great in so many other ways. These guys don't go into the math/formulas involved in World of Warcraft. I subscribe to other, more detailed WoW podcasts, but this is the first one I listen to because these guys remind me why I play-- because it's fun. I was worried Luke leaving was going to be a big blow, but the shows following his departure have been still just as funny (the moment where Jeff talks about his mom coming over for Mother's Day taking away from his playtime made me spit up my drink) and he will be missed, but the show does go on! Cross-gaming talk is too funny! More of it please! The information is clear, and well organized. The cast mates are all easy to get to know and very personal. There is such great humor within the show, it is absolutely great. Keep Up the AWESOME! JOB!! Most of the topics are unrelated to the game. Alot of useless information and the hosts attempts at being funny is both annoying and unfunny. This is easily in my top 3 favorite podcasts. Their reviews of patch notes and World of Warcraft forum posts keep me updated on new information about the game. It stays funny, even after the second or third listen, which is a better compliment than most podcasts can boast. I usually listen to it while playing the game, which helps motivate and entertain me at the same time. The devilishly funny commentary and even the off-topic portions help break up the podcast perfectly into manageable sections of hilarity. Overall, this is a great podcast to listen to, and I've gone out of my way to tell my close friends and associates about it. I find that Legendary Thread supports my family values of juvenile humor, poop jokes and swearing. The discussion are fun, and the game info is useful for all types of players. A must listen for any WoW player. This podcast is great and very entertaining, it is, a little on the "explicit" side, but children shouldn't be playing the game in the first place. Keep up the good work guys.